A Jordan sneaker app powered by a private virtual token with a community of over 200,000 sneaker fans. Register for news on the drop date and how to earn SNC, the SneakerCoin currency. © Phusion, Inc. 2018. 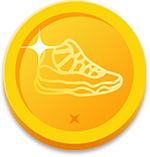 SneakerCoin is a trademark of Phusion, Inc. All Rights Reserved.